FIRE!! 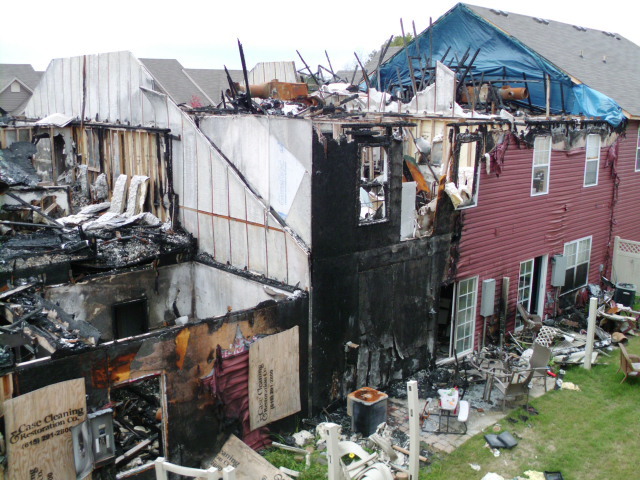 Do you have an Emergency Action Plan for a Fire in Your Home? Look at the pictures below. Recently I inspected a townhome that was inhabited by a family of 5. The three children were about 5, 3 and 1.5 years old. All bedrooms are upstairs in the two story townhouse. Across the street was a terrifying scene shown in the pictures below. A row of 5 townhouses exactly like the one I was inspecting. 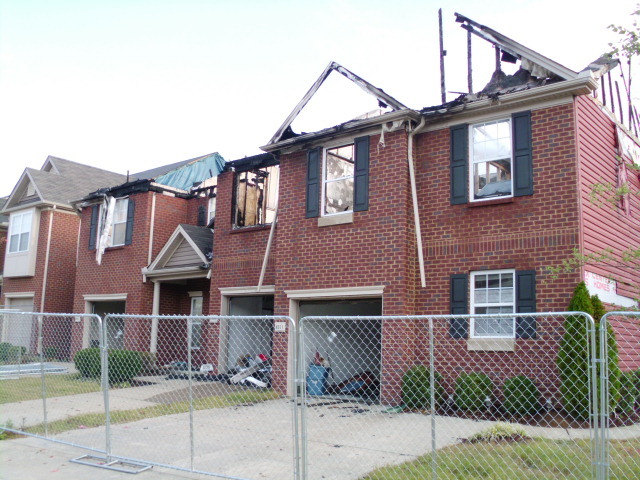 Obviously a horrific fire had devastated four of the units in the row of townhomes. Reports indicate a propane gas grill may have started the fire. As I looked at the family who lived in the home I was inspecting I wondered if they had a plan in case of a similar situation in their home. 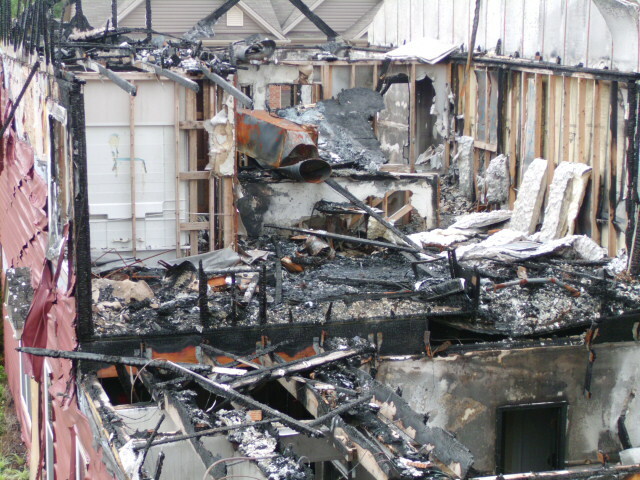 This first picture is the front of the complex. The photo below is of the rear of the complex. The next picture is a closeup of one of the units. This one appeared to be where the fire started. All families should have an emergency action plan in case of a disaster like this. Especially those with children in the home. Nashville TN Home Inspections – Williamson County Association of Realtors (WCAR) elects 2012-2013 Board of Directors. The 1,500 members voted to elect three new executive officers and five new directors. HABITEC Home and Buildings Inspections, LLC, conducting home and commercial buildings inspections throughout Middle TN including Nashville, Brentwood, and Franklin, wishes these newly elected members success in the coming year. 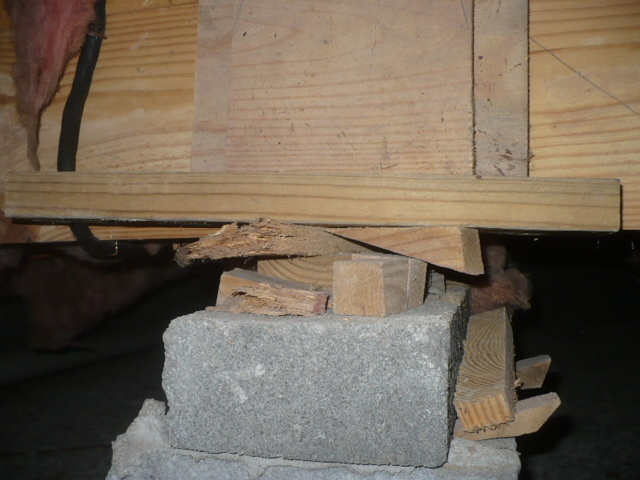 Nashville Home Inspector – What’s Wrong With This Picture? HINT: Why is there a bucket under that pipe? ANSWER: Something is leaking! It should not be there, unless of course it is needed. So what can be the source of the leak. Well, that white pipe looks suspicious doesn’t it? So, to fill in the missing pieces, you are standing in an attic looking down at the attic floor. That white pipe is a plumbing vent pipe. The kind that goes up through the roof and sticks out the top of the home. Almost every home has them. But whenever you poke a hole in the roof, you have to take measures to prevent leaks. For these type of vents, a roof boot is used to surround the pipe as it goes through the roof. See the picture below of this pipe as it goes through this roof. What’s wrong? ANSWER: The crack is what is wrong and the crack is why there is a bucket in the attic. This cracked roof boot is allowing water to penetrate into the attic and onto the ceiling below the attic, at least it was until they put the bucket up there. This is not what we have in mind when we talk about a bucket list. A better solution is simply to have another roof boot installed. That rubber-like neoprene component is only good for about 7-8 years before it starts to crack. Another quicker fix is to have a boot overlay installed, which is a similar device that simply slides down over the cracked boot. Works good and lasts about as long as the new boot. Either way, something new on the roof is a better solution than a bucket in the attic! Look at the picture below. What is wrong? HINT: Junction boxes should be used for junctions. 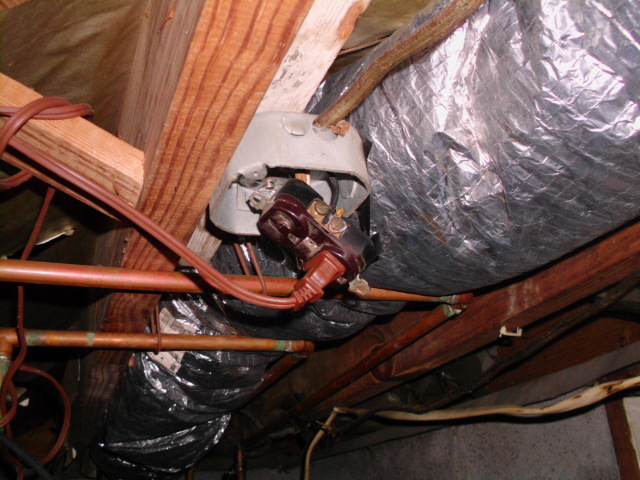 ANSWER: Junction boxes should be used to house any junction of electrical conductors, or wires. But, junction boxes, like the one in the picture above, should not be used to rig an outlet so one can plug in an extension cord. So there is a lot wrong with this picture. Junction boxes should be used only for conductor junctions and the box should be closed after the wires are joined and inserted. Outlets should be housed in outlet electrical boxes with that appropriate cover plate. Extension cords should not be used as permanent wiring. If you need permanent wiring, call an electrician and have a dedicated circuit put in. The installation in the picture above is a fire or electrocution waiting to happen.